You are browsing the archive for hell. 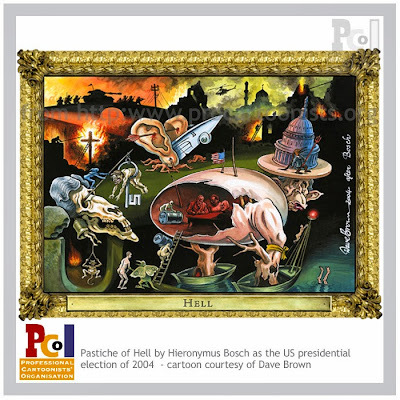 Dave Brown cartoon pastiche of Hell by Hieronymus Bosch as the US Presidential election campaign of 2004. One of the highlights of this year’s Shrewsbury festival is a one-man show of the work of Dave Brown, editorial cartoonist for the Independent newspaper here in the UK. Dave is well known for his weekly Rogues Gallery feature, which pastiches great works of art and reworks them for current affairs – it’s a sort of painterly version of an internet mash-up. Dave has allowed us to preview some of his work here in the run up to the event.